Make the “meat” dough. Heat the oil a non-stick frying pan over a medium heat. Fry the onion, leek, garlic, seasoning, spices and herbs for 2–3 minutes. Meanwhile put the cranberries, apricots and chestnuts into a blender and blitz until they’re all a similar size. Add these to the frying pan and sauté for 3–4 minutes until everything has softened.Pour in the cider, stock and miso paste. Stir together and allow the mixture to simmer for 2 minutes before turning the heat off. Combine the dry ingredients. Once the wet mixture has cooled slightly, mix with the dry ingredients. It should form a nice dough.If your mix is wet add a little more chickpea flour. Tip the dough out onto a clean work surface and knead for 10 minutes. Leave to rest.Preheat your oven to 170°C (340°F). Combine the rub spices in a bowl. Shape the dough into a sausage 10cm (4in) in diameter.Sprinkle the rub onto your work surface. Roll the dough in the rub. Roll the dough in a piece of muslin (cheesecloth), twist the end stightly, then tie each end with cook’s string to secure it. Place the wrapped dough into a deep baking tray together with the rest of the roasting ingredients and bake for 2 hours on the bottom shelf, turning over half way through to ensure it cooks evenly. Once baked, lift the roast out of the tray, reserving the roasting liquid, leave to cool slightly, then remove the muslin. At this point you can either chill it in the fridge for up to 3 days or continue. If you are not cooking now, make the gravy (below) and keep in the fridge, then reheat. An hour before you want to serve, roll out your pastry into a tea towel-sized rectangle around 3mm (1/8in) thick. Cut strips a third of the width of the pastry on each side, so you can cross them to make a lattice. Spread the cranberry and orange sauce over the roast, lift it into the centre of the pastry, wrap it up, then transfer to a baking sheet lined with non-stick baking paper. Combine the glaze ingredients in a bowl, then brush over the top of the pastry. Bake for 15–20 minutes, or until golden. While the wellington is cooking, strain the roasting liquid from the baking tray through a sieve into a saucepan, pressing to squeeze out all the lovely juices. Place over a low heat and simmer for10 minutes until you have a thick gravy. Mix the cornflour with the water and add it to the gravy whilst whisking until it thickens to your desired consistency. 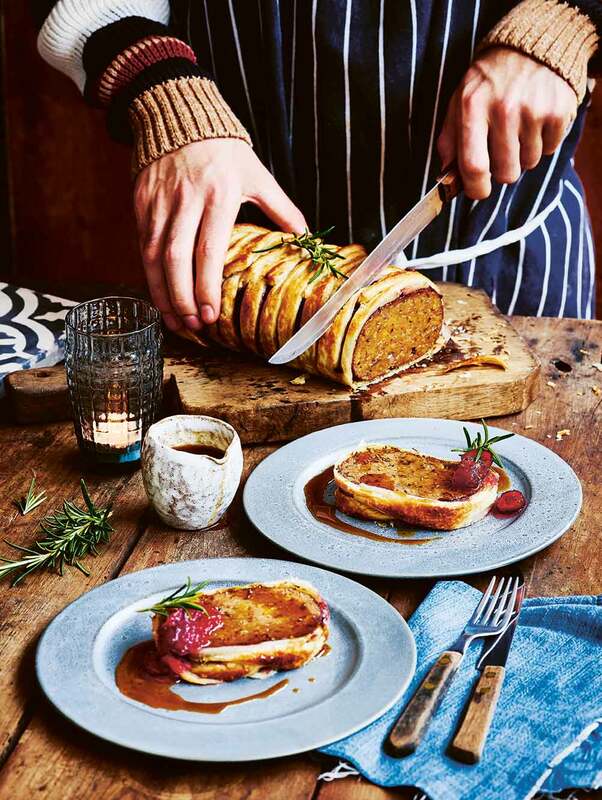 Remove the wellington from the oven, carve and serve with the rich gravy. 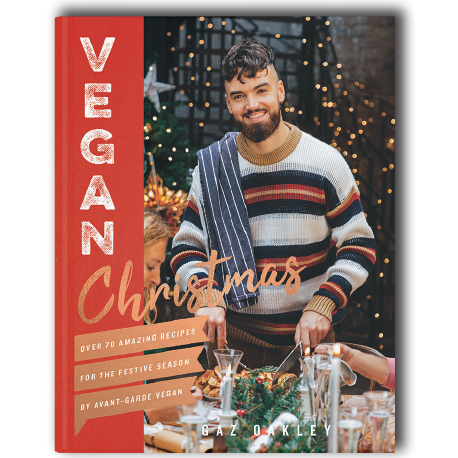 Now Gaz has put together his perfect VEGAN CHRISTMAS cookbook to help anyone cook their own vegan version of an extravagant festive feast.